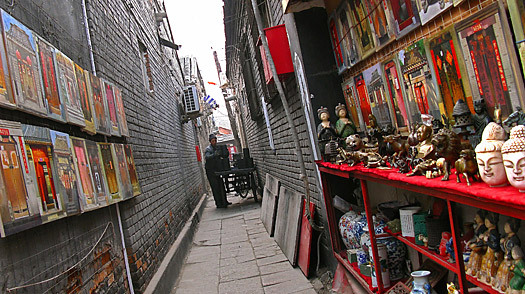 After a stop for refreshment in Shichahai, head east on Guloudajie Road into one of Beijing's few remaining hutong neighborhoods, with narrow alleys and single story traditional courtyard houses. Hutongs once dominated the city, but in recent years many have been leveled in the name of modernization. Trishaw drivers hang around offering tours, but a better and cheaper (not to mention healthier) bet is to rent your own bike and get pleasantly lost in the back lanes around the Drum and Bell towers. It's not hard to find one of numerous small bicycle shops nearby. Alternatively, look for one of 20 stands dotted around the city, run by the Beijing Bike Rental Company, which rents bikes by the hour, the day or longer.